Xiaomi isn't particularly generous with the Redmi 3S accessories: a 2A A/C Adapter and a microUSB cable for charging and data is all you get. Hardly a surprise - the original Redmi 3 didn't offer anything extra either. At 139.3 x 69.6 x 8.5mm and 144g, the Redmi 3S is identical size-wise with the original and the Redmi Pro flavor. For an entry-level priced mid-ranger, the Xiaomi Redmi 3S is as premium as it can get for the class - an aluminum unibody with curvy edges done in present matte finish. The phone is pretty much the same as the Redmi 3 Pro and the Redmi 3 sans the diamond pattern. As usual, not everything is metal as there are two plastic strips at the back for obstruction-free signal reception. The screen glass doesn't have any specific scratch protection and no fancy shapes such as 2.5D effect. 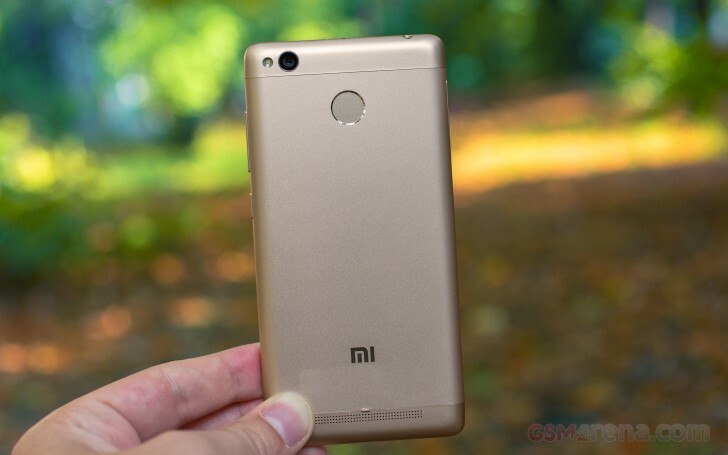 But these are the "cheapest" compromises you'll find around the Redmi 3S. The fingerprint sensor is nicely carved within the metal back and fits very well in the curvy design. It's of the always-on kind and works blazingly fast with high accuracy. Finally, it's worth nothing the tiny glossy frame circling around the screen glass. It adds nice accent to the overall design and enhances the premium feel all around. A smartphone with a 5-inch screen is a rarity these days, and we appreciate that a lot. The compact class share is slowly but steadily shrinking, yet we're sure the 5-inchers still have their fans. The Redmi 3S is a fine example of a perfectly-shaped smartphone for great pocketability without compromising the screen estate that much. Its metal and matte finish boost the grip, while its mid-sized body and weight makes it a real treat both in hand and in pocket. The Xiaomi Redmi 3S control layout is nothing out of the usual. Above the display, the earpiece is sided by a couple of sensors and the 5MP selfie camera. Below the screen, we find the traditional capacitive control set: Task switcher, Home, and Back keys. There is a status LED around too. The keys are still not backlit, though. The left side houses the ejectable compartment, which can either take two SIM cards or one SIM and a microSD card. The right side is where the volume rocker and the power/lock key are. On top of the Redmi 3S we find the audio jack, the secondary mic, and the IR blaster. At the bottom is the primary mic and the microUSB port. The 13MP camera lens is on the back, accompanied by a single LED flash. The loudspeaker grille is also around.